America has a debt problem. We don't bring in enough revenue, and we spend too much money. But don't fret. Our government has a plan to fix all this by ... cutting the cost of coining pennies and nickels. It's not exactly an original idea. Convinced that "change" is good, Congress is also considering a plan to stop printing dollar bills, and substitute longer-lived dollar coins in their place. But before you go thinking you've heard this story before, you haven't -- or at least not recently. In 1943, in the midst of World War II scrap metal drives, a shortage of copper convinced the government to stamp pennies out of steel. In 1982, the U.S. Mint stopped coining mostly (95%) copper pennies, and switched over to a formula comprised of 97.5% zinc, and only 2.5% copper. The reason then, as now, was that the metals going into minting the pennies were expensive, and it was getting to the point where it cost more to mint pennies than the $0.01 the coins were supposedly worth. More recent efforts to scrape together some governmental spare change have mainly centered on killing the penny entirely. In 2001, a bill titled the Legal Tender Modernization Act called for a halt to minting of the coin. When that failed, the 2006 Currency Overhaul for an Industrious Nation (COIN) Act -- not to be confused with the 2011 Currency Optimization, Innovation and National Savings (COINS) Act, which aimed to shred the paper dollar -- took a parallel approach, aiming to render the penny essentially useless by requiring all cash transactions in the U.S. to be rounded to the nearest nickel. The COIN Act failed, of course, in no small part due to the tireless activism of Kevin Federline -- the former Mr. Britney Spears -- who teamed up with the activist group Americans for Common Cents and cell-phone company Virgin Mobile (conducting a one-cent-texting promotion at the time) to oppose the vilification of the penny. Hoping to avoid the ire of K-Fed and Co. this time around, the Obama administration is going out of its way to reassure penny savers and hip-hop wannabes that killing the penny "is not a proposal we have put forward." All they want to do is make minting the things a bit cheaper. Honest. But here's the thing: If the rationale behind changing the composition of the penny is that it's irrational to spend more to make them than they're worth as legal tender, then the plan is doomed from the get-go. You see, it costs U.S. taxpayers something on the order of 2.4 cents to mint each penny, and about 11.2 cents per nickel. One culprit: Rising commodities costs, and in particular, the rising cost of the metals that go into making the coins -- zinc and copper for the penny, nickel and copper for the nickel. And so the theory is that if we can switch around the chemical composition of the coins, we might have some walking-around money left after their manufacture. But here's the problem: Of the 2.4 cents it costs to mint a penny, just 0.6 cents goes to the cost of the metal. You could substitute a hypothetically completely free metal for all the zinc and copper that currently goes into making a physical penny and it would still cost 1.8 cents to mint it. There is, however, at least one bit of good news in all this numismatic math. 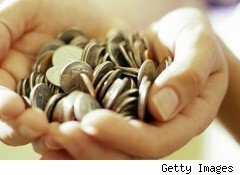 While the economics of minting one-cent pieces may be irredeemable, there's hope for the nickel. The metal content of a 5-cent piece makes up about 6 cents of the 11-cent minting cost. There's a distinct possibility, therefore, that we could break even by replacing the expensive nickel and copper content with some worthless alternative.